710 Study San Rafael Neighborhood Posts: Car Emissions vs. Car Crashes: Which One's Deadlier? Car Emissions vs. Car Crashes: Which One's Deadlier? The ever-thought-provoking David Levinson posed a question at his Transportationist blog earlier this week that's worth a longer look: Are you more likely to die from being in a car crash or from breathing in car emissions? If your gut reaction is like mine, then you've already answered in favor of crashes. But when you really crunch the numbers, the question not only becomes tougher to answer, it raises important new questions of its own. First, let's look at U.S. traffic fatalities at the national level. For consistency with the pollution statistics (more on that in a moment), we'll focus on 2005. That year, there were 43,510 traffic crash fatalities in the United States, according to the National Highway Traffic Safety Administration. That's a fatality rate of roughly 14.7 per 100,000 Americans. 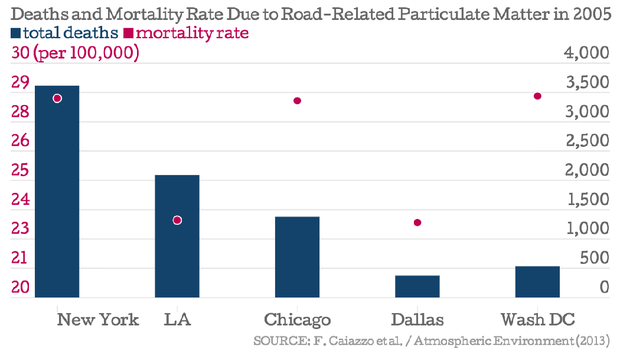 Now we turn to deaths attributable to air pollution—more specifically, to particulate matter produced by cars. A research team led by Fabio Caiazzo of MIT, who appears from his university profile to be an actual rocket scientist, recently quantified the impact of air pollution and premature death in the United States for the year 2005. They reported that about 52,800 deaths were attributable to particulate matter from road transportation alone. (Road pollution had the largest share of any individual pollution sector, at around a quarter of all emissions-related deaths.) That's a mortality rate of roughly 17.9 per 100,000 Americans. By that estimate, road-related particulate matter was responsible for about 19 percent more deaths, nationwide, than car crashes were in 2005. And keep in mind that particulate matter isn't the only air pollutant produced by cars (though it is the most significant type). Caiazzo and company attribute another 5,250 annual deaths to road-related ozone concentrations, for instance. In other words, the true health impact of auto emissions may be much greater. such they're convenient (and perhaps even comforting) to ignore. A road death, meanwhile, is stark and tragic and undeniable—in political terms, a much stronger platform. But what should cities do about it? Well, they can start by drawing more attention to the problem. A true Vision Zero campaign, for instance, would acknowledge that even a New York without road fatalities wouldn't be a New York without car-related deaths and illnesses. (That's not to criticize this initiative; just to make a point.) As a stronger step, cities can follow the likes of London, which recently announced an additional tax on emissions-heavy cars, and start charging these drivers the true cost of their social impact (or something closer to it). A few drivers can pay now, or general public health can pay later, but everyone pays eventually. * It's worth pointing out that the Caiazzo study and the GBD reach vastly different conclusions about how deaths are attributable to total emissions in a given year: roughly 200,000 for the former to roughly 103,000 to the latter.